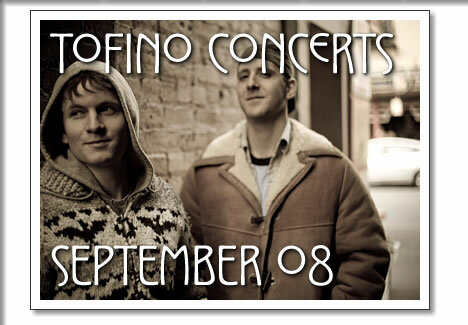 The following concerts in Tofino are happening in the month of September 2008. Tickets are available at Tofitian and Long Beach Surfshop in Tofino. Vancouver's resident dance-punk savants You Say Party! We Say Die! are a catalyst on the edge of a scene brimming towards explosion; hybridied, mechanized, philosophizing machines that have learned self-awareness and found their soul. Self-styled pioneers and genre-warriors are noticing this band taking on the world on their own terms. They are reaching fever pitch in Vancouver's indie rock scene with insanely catchy beats and viciously fun live shows. Five Alarm Funk is a Vancouver-based, 12-piece rhythm machine that pounds out a delirium-inducing live show, brimming with original funk and afro-beat grooves. The band's horn and percussion-driven instrumental jams feature searing guitar leads and horn solos wailing and soaring above a four-man percussion maelstrom that is grounded by Neil Towers' juicy bass lines. The band's wicked cross-rhythms and frenetic, costumed stage show appeals to jazz fans and clubs kids alike. Five Alarm Funk has carved out a word-of-mouth fan base from a series of crowd-pleasing performances at clubs, concert halls, and festivals throughout b.c. Interaction between the crowd and the band is a huge part of the show, and they try to make every show an event. When a group of musicians all end up at the end of the road, meet up and start a band, its safe to say that the rule book is out the window. Ronny Weeks and Los Dukes formed over a year ago through a slow progression. First it was Ron and Chris Puget, then drummer Liam Mackenzie joined them. He mentioned that Joel Gray played bass and all of a sudden they were a band. They play music that is inspired by the Tofitian culture. Rich with surf, reggae rock influences that talk about days at the beach, camping, good times, love and love lost. Ronny expresses himself through simple chord progressions and thought provoking lyrics. The band takes inspiration from Johnny Cash, Nirvana, the Beatles and classics like Neil Young and CCR. Tofino concerts in September 2008 from Tofino Time Magazine. Shows at the Tofino Legion and other music events in Tofino.